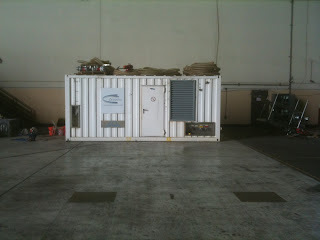 For the person who asked what our helium purification unit looks like -- here you go. It is self contained, built to live inside a standardized "small" shipping container, and runs off a generator. To get a sense of the scale, note the door in the center. It can be transported on a trailer as needed, but we tend to keep it in the hangar. wow. a little bigger than i expected, ha!